Bear-Patrol mark the third anniversary since receiving The Queens Award for Voluntary Service at Brighton Marina today (June 2). 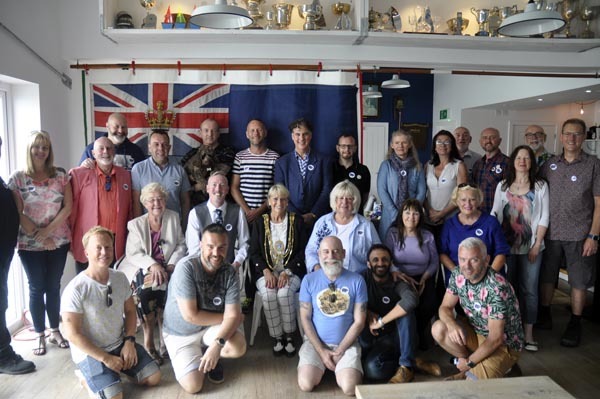 BEAR-Patrol the social networking group, celebrated the third anniversary of receiving The Queens Award for Voluntary Service by hosting a breakfast of tea and bacon butties, for the new Mayor of Brighton & Hove, Cllr Dee Simson at the Brighton Marina Yacht Club today, Saturday, June 2. The event raised £217.52 for the Rainbow Fund, who give grants to LGBT/HIV organisations delivering effective front line services to LGBT+ people in Brighton & Hove. Since Danny Dwyer started Bear Patrol in May 2008, they have together raised a total of £193,472.23 for local good causes. They hope to push the figure over £200.00. after this years Hibernation Community Luncheon on Sunday, October 21 at the Old Ship Hotel. For more information about Bear-Patrol check out their Facebook Page.